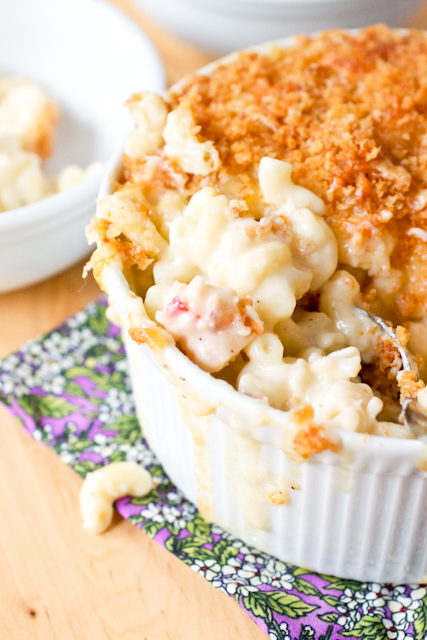 Lobster mac n’ cheese couldn’t be easier to make at home than with this recipe so you can say good-bye to $30 restaurant prices for lobster mac! When early June rolls around each year, I start dreaming of lobster. Not quite literally, of course, but it’s a food I feel no summer in New England would be complete without. Bright red, juicy claw meat dipped in butter. The struggle to bust the tail out of the shell…and then dipped in melted butter. A side of local sweet corn rolled in salt, pepper, and yes, more butter. It’s quite a meal and my gosh I love it! Sometimes I hold off on this if we have a vacation planned so that I can indulge at a wooden picnic table under an umbrella with the salty sea air spritzing my face but this summer I couldn’t wait. Until the last couple weeks of July, we had no vacation planned and I was starting to fret that I’d miss out on one of my favorite summer treats. So I made lobster mac n’ cheese. It’s a recipe I’ve had on my to-make list for what seems like years and it certainly didn’t disappoint. And really, it was no more difficult to make than regular mac n’ cheese. If you can’t find cooked lobster in your seafood market or grocery store and if you’re petrified of cooking a whole lobster, see if you can find frozen tails. You’ll need to thaw them in the fridge first, but steaming them only takes about 12 minutes. That’s the most complicated thing about the whole recipe – the rest is just a basic mac n’ cheese recipe. So so easy! We devoured this mac n’ cheese for a casual Friday night dinner (a halved recipe for the two of us) and ate the leftovers for lunches. But if you’re having company or need a date night-in, this would be a fantastic meal to serve – fancy and comforting at the same time! If you can’t find fresh lobster near you, frozen uncooked tails work great! Just thaw them overnight in the fridge and then steam them in a few inches of water for about 12 minutes until they are bright red. Preheat the oven to 375° F. Set aside a 13×9-inch baking dish or 6 to 8 individual gratin dishes. Cook pasta according to package directions in a large stockpot but cut the cook time down by 3 minutes – it will finish cooking in the oven; drain pasta well and return it to the hot pot. Meanwhile, melt 6 tablespoons of butter in a medium saucepan set over medium heat. Whisk in the flour and cook for 1 ½ minutes, whisking constantly. Slowly whisk the milk into the butter-flour mixture (called a roux) until no lumps remain. Heat the milk, stirring frequently, until it thickens enough to coat the back of a spoon and starts to bubble in the center of the saucepan (this should take about 5-7 minutes). Once it bubbles, let it cook, stirring the bottom of the pan to prevent burning, for 2 minutes. Off the heat, add in a handful of cheese, stirring it into the milk with a rubber spatula until it is completely melted; repeat with the remaining cheese. Stir in the salt, pepper, and nutmeg. While the milk cooks, melt the 2 remaining tablespoons of butter in a large sauté pan over medium heat. Toss in the bread crumbs with the melted butter and toast them until they are golden brown, stirring occasionally at first then frequently towards the end. Remove the pan from the heat and set aside. Add the lobster meat into the cheese sauce then pour the entire mixture over the hot pasta in the stockpot. Mix everything together well, making sure the pasta is well-coated with the sauce. Transfer to the baking dish(es) and place it/them to a baking sheet to avoid spillage on the bottom of the oven. 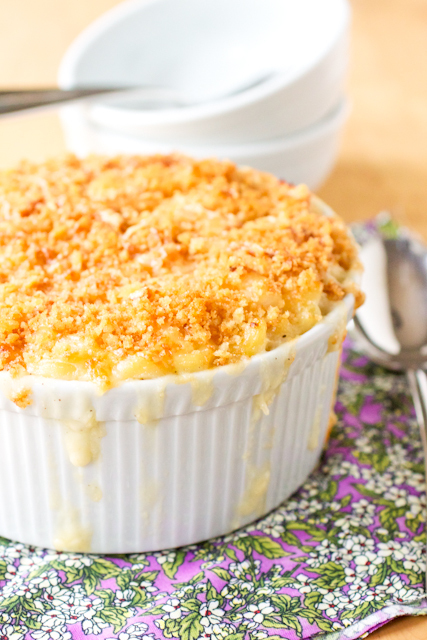 Sprinkle the bread crumbs evenly over the top of the mac n’ cheese. 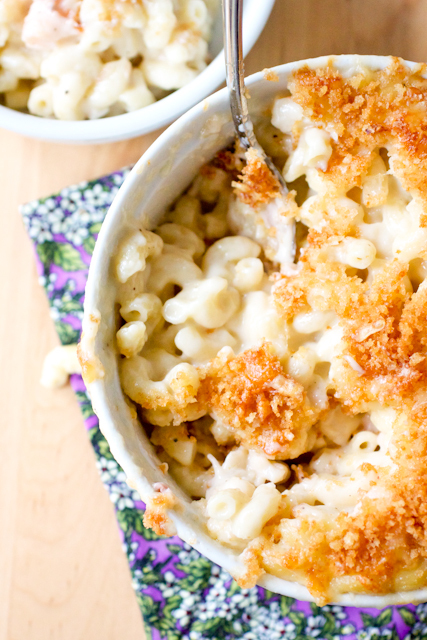 Bake the large dish for 45-50 minutes and the smaller dishes for 30-35 minutes, until the mac n’ cheese is bubbly. Cool for 10 minutes before serving. Suddenly, my bowl of oatmeal right now is wwaaayyy less appetizing. I need this mac and cheese right now. I’m on my way to Maine next month . . . this will be the perfect prelude. I don’t think I could get enough lobster. Holy cow this sounds so amazing!! Unfortunately I live in Arizona so I have literally zero access to fresh seafood – but thanks for sharing the tip about using frozen lobster tails, that will come in handy! Instead of salt, add a teaspoon or so of Better Than Bouillon Lobster Base…makes it taste like you slaved over a homemade Lobster stock! I’ve made a similar version for years 🙂 When I am too lazy to make the actual Lobster stock, I “cheat” and use the store bought base…. Hi Robin! I think this would freeze well. I don’t think the seafood would change anything since it’s already cooked. I hope you love it! !